The Labour Party leader was greeted by scores of supporters flocking around his car, to chants of "Joseph! Joseph! ", in mad rush to embrace him, hug him, or in the case of the women, plant a kiss on his cheek. 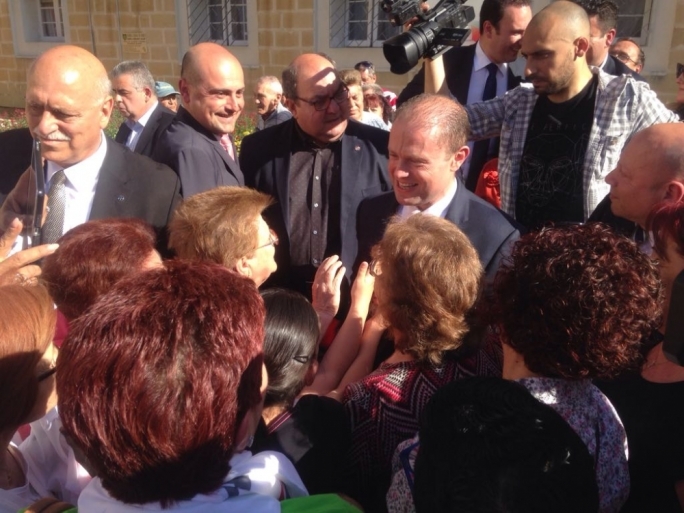 Prime Minister Joseph Muscat was given a hero’s welcome as he stopped by Ta’ Xbiex this afternoon to meet a few hundred eager supporters. The party faithful, who braved the afternoon sun for an opportunity to meet the Labour leader, were not disappointed as Muscat stopped to take photos with as many people as he could. Flanked by tourism minister Edward Zammit Lewis, digital economy minister Manuel Mallia, MPs Clifton Grima and Michael Falzon and candidate Nikita Zammit Alamango, Muscat addressed the crowd gathered in front of the Labour Party club, and explained the proposals announced by the Labour Party on Monday morning. He said that with the country only 32 days from choosing the direction it wished to take, the party was prepared and up for the challenge. Muscat insisted that the Labour Party’s will once again be presenting the nation with a positive campaign. Muscat said that tax was one of the main priorities, with the government introducing a bonus system that will see all those working and earning less than €60,000 receiving a bonus of between €200 and €340 a year. “We will be giving most to those earning the least. Even those earning minimum wage and not paying any tax,” he added. In addition to this, Muscat said a new Labour government would be offering help to part-time workers, those looking to buy their own property or extend their homes and students who obtain a Master’s degree or Doctorate.